When I retired from teaching in 2006, I did not retire from learning. Taking the MG course was the first item on the bucket list and I could hardly wait for classes to begin. I have gardened my whole life for a spark was lit when I planted some Black Seeded Simpson as a very young child. Speakers did not disappoint although I thought the testing was stressful for other participants. Actually thought I would have to use EMT skills (another retirement course) as the anxiety was so high during the final. Gardening is probably the most sustaining interest of my seven decades and if I know anything it is how much I don’t know. . Like Sisyphus, we sometimes think we will get on top of the hill only to fall back to the bottom. There is always a new plant, a new disease, a new bit of information. 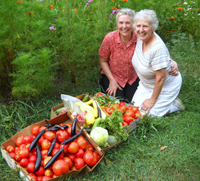 I think sharing with other gardeners is the best part of being a Master Gardener. For my intern hours I spent a lot of time at God’s Little Acre (a project to raise veggies for Survival Center) and helping revive our Wilbraham Community Garden. I did time at Farmer’s Markets, wrote a few articles and served on hotlines. It was all good. As ten years have passed, I remain active on the Hotline and keep learning. I attend MG activities when I can but I would not consider myself a lover of meetings and I dislike driving. Rather selfish in that respect. The ten years have introduced many other volunteer activities such as service on our local Agriculture Commission and Open Space. What the course did was to prepare me to be a better steward to Nature. I have never had a problem meeting hours of service. I do cringe when “Master Gardener” is used to describe me for I will never master gardening. Taking the course was not the “end” but a stimulus to go on. I think a positive answer to “Do you like to dig in the dirt?’ says it all for anyone who are thinking about taking the course.